Home environment sensors are available to detect floods, smoke, carbon monoxide, natural gas, and extremes of temperature. These sensors can warn you if a pipe bursts, a sink or bath overflows, a fire breaks out, or gas is left on at your gas cooker or heater. These sensors could also alert you if carbon monoxide is being released by a faulty heater or partially blocked flue, or if the temperature in your home gets very cold, perhaps because the heating has broken down. These sensors can provide early warning of overflows and leaks that may grow to become a flood. This water can make floor surfaces slippery and damage your property. These sensors may be ideal if you've found yourself forgetting to turn your taps off, and worry that if this happens again your sink or bath could overflow. However, these sensors will also alert you of burst pipes and leaks. It is usually recommended not to install smoke alarms in a bathroom or kitchen as steam or smoke from cooking could trigger false alerts. Instead of a smoke alarm a temperature extremes detector or heat alarm is recommended for the kitchen as this will automatically raise an alarm if the temperature reaches a level that suggests a fire has started. 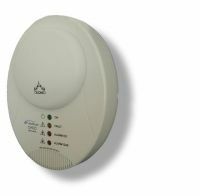 These detectors provide an immediate alarm when they detect dangerous levels of carbon monoxide. Carbon Monoxide is a gas which has no smell, taste or colour. It is produced by the incomplete combustion of fuels including gas, oil, coal and wood used in boilers, gas fires, water heaters, solid fuel appliances and open fires. Exposure to above recommended concentrations of carbon monoxide can quickly cause headaches, dizziness, nausea, convulsions and even death. These units detect the leakage of gas, such as from a left on hob, leaking pipe or unlit gas fire. Leaking gas is dangerous, ultimately, leaking gas can build up to dangerous levels which can result in explosions. Gas leaks can result from mistakes such as forgetting to light a gas ring or gas fire and natural causes like a pilot light blowing out. Gas shut off valves physically cut the gas supply when triggered by a natural gas detector sensor connected to a telecare control box.